In decks that rely on non-land mana (if that's a thing), it might be good. Can't really see much other use, tho. "Why get rid of our enemies one at a time, when we can just kill 'em all off at once, Mr. Mizzet?" Up: Pie break - neither blue nor red can destroy specific permanents (red gets permanent sac which is not the same thing). The overload is probably too strong, too - that's basically an instant "I Win" button. 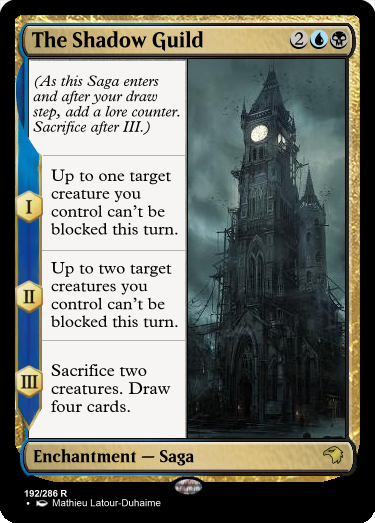 I don't know how I feel about making challenges requiring renders, so I decided instead to make a card that feels very old style. When CARDNAME enters the battlefield, you gain 5 life. You may cast CARDNAME from your graveyard if there are three or more instant and/or sorcery cards above it. Up: Feels very old-style. Not overpowered, but it looks playable. 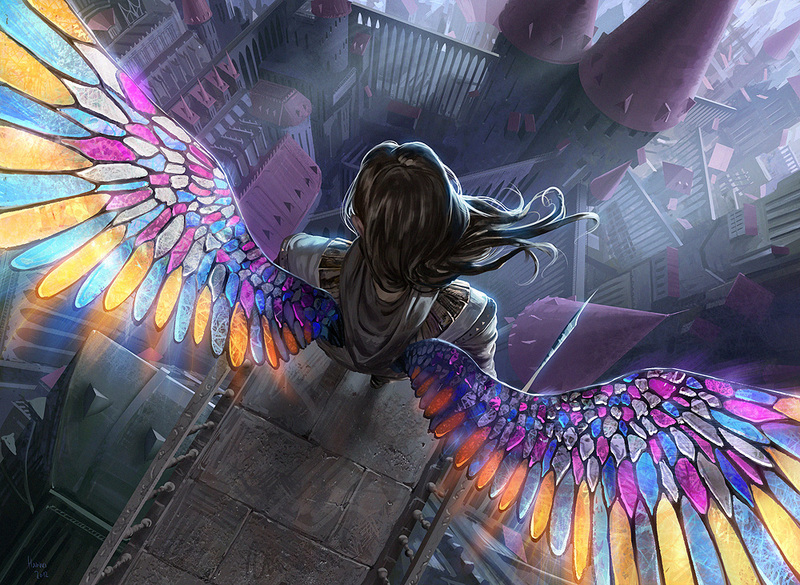 When Kelros flows overhead, his wings block out the sun, but his fire is bright as day. Up: I think this card is really underpowered. Yes, you should give it an old legends feeling, but at least meke it an 8 mana 8/8 flyer. That’s fair. I did make sure it was bigger than Shivan Dragon though. Up: A 4/4 for 3 with abilities it can use the turn it comes out is pretty strong, imo. Sidenote: Is there really no newer silver borders than the Modern template? Can’t you manually change the border color? 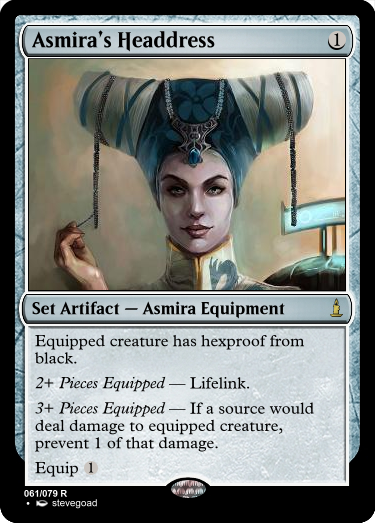 Up: The concept is silver-bordered, but everything the card does is doable in black-border. 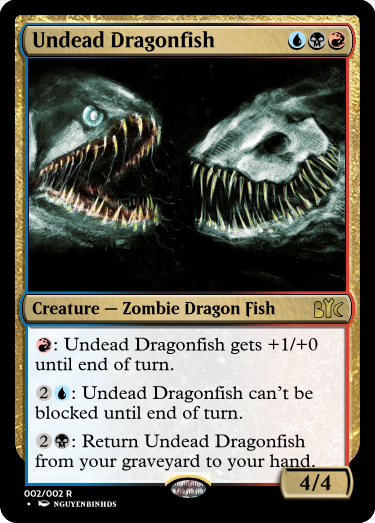 Also, this is a card no one would play. 3: Choose one of the enchanted creatures, then turn all three face down and shuffle them. Reveal one of an opponent’s choice. If that card was the chosen creature, that player draws two cards. If not, you draw two cards. Up: That's a lot of hoops. Do you turn them back up afterwards? Enchanted creature gains +1/+1 for each white permanent you control (except itself and this card). other creatures you control can't attack, also your opponent takes no damage from enchanted creature's attacks. If Blessing of the Heavens would leave the battlefield as the result of enchanted creature leaving the battlefield, return this card to the battlefield instead and transform it, exiling enchanted creature. When Reborn of the Light enters the battlefield, put +1/+1 counters on it equal to your devotion to white. Other creatures you control can't attack. Your opponent takes no damage from this card's attacks. Up: What are your restrictions? 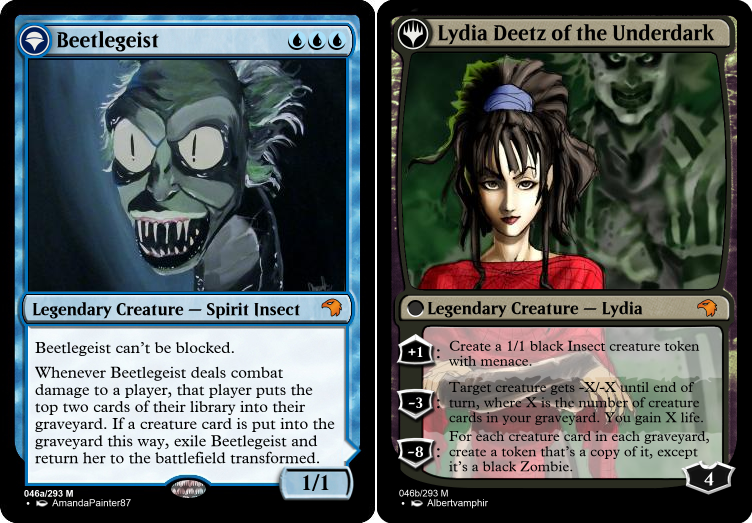 Lydia Deetz As per the rules of the game, please post a new restriction and the previous "new" restriction as the current "old" restriction. Forgot to add it, and never got a chance to fix it until now. Up: What's the p/t on Reborn of the Light? Also, completely halting your offense in exchange for one rather expensive white defender is probably not something I would ever do, even if I was trying to get off an alternate win condition. When enchanted creature deals combat damage to a player, put a +1/+1 counter on enchanted creature and that player puts the top card of their library into their graveyard. Definitely fits squirrels' swarming capabilities. Nice overall. When Storm enters the battlefield, you may add a snow land and/or mountain from your library to your hand. If Storm Dragon leaves the battlefield, add or to your mana pool. example: If this card was cast using 7 mana, its power and toughness become 7/5. Up: I don't know how I feel about this - land searching is lowkey in all colors, but the card does not really form a neat package overall. Not really a fan. CARDNAME enters the battlefield tapped unless you control a Swamp. When CARDNAME enters the battlefield, target opponent loses X life, where X is the amount of mana spent to cast CARDNAME. @lydia Deetz: First, your card doesn't have to do anything with squirrels. You need to fulfil both requiremants. Second, red alone shouldn't be able to search for lands. - Keywords allways come first, except for cast trigger, allternate casting cost or cost reduction. - There is no such thing as a red land. You could search for a Mountain or a land that produces red mana. I'd rather go for the first. - Triggers allways start with "when" or "whenever". You did this in the first ability, but why not in the last? - You can't add . " style="max-width:100%;"]" style="max-width:100%;"] is a cost that can be paid by mana that was produced from a snow source. Just make the dragon snow and you're fine. When ~ enters the battlefield, you may search your library for a snow land or Mountain, reveal it, put it into your hand, then shuffle your libary. When ~ leaves the battlefield, add " style="max-width:100%;"] to your mana pool. Darting Flame deals X damage to target creature, where X is the ammount of mana spent to cast it. For each 2 mana used to cast this card, put a loyalty counter onto your commander. If you activate any of your commander's abilities (after they resolve), exile your commander, and replace it with another legendary creature or planeswalker you control, or is in your hand or library. "for each 2 mana used to to cast..." is an ability I've wanted to do for a while. Up: Wording issues aside, putting loyalty counters on Planeswalkers is a good idea in theory...but Commander color identity rules means that this would require a 5-color Planeswalker with the "Can be commander ability", which...doesn't exist. In other words, this card is literally unplayable. Lieutenant — As long as you control your commander, other creatures you control get +1/+0. Might be a bit pushed but I think the increased vulnerability to removal and the general preference for bigger effects in commander makes it okay. New: Has something to do with Conspiracies, or is a Conspiracy spawning/tutoring a token or card of <other restriction>. Up: Since it's designed for Commander, and isn't as big of an effect outside of that format, I think it works for what it is. Old: Has something to do with Conspiracies, or is a Conspiracy spawning/tutoring a token or card of <other restriction>. Up: Nice ability. It took me a while to get what the "llok at conspiracies" ability does. You allways have the effect, ssince you allways control the Ravens (else the ability wouldn't be yours). 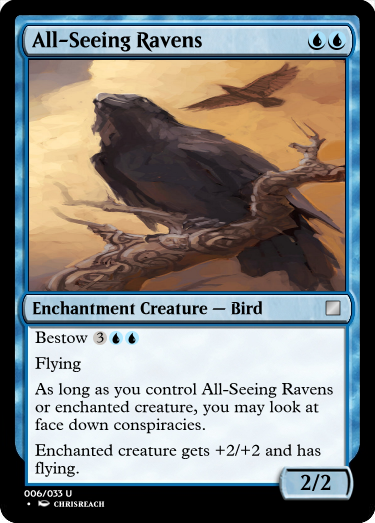 But if you enchant another player's creature, they can also look at conspiracies. I think an easier way to write this is "You and enchanted creature's controller may look at..."
Or maybe you wanted only enchanted creature's controller as long as it's attached to a creature? That would be a bit wordier. Whenever a spell or permanent with one of the chosen names deals damage to an opponent, you may search your library for a planeswalker with one of the chosen names, reveal it and put it into your hand, then shuffle your library. Up: Since Conspiracies are meant to be played in Limited, having a Planeswalker to search for is unlikely. However, if you do pick one up, it lets you play it more often, which is a plus. +2: You may sacrifice a land. 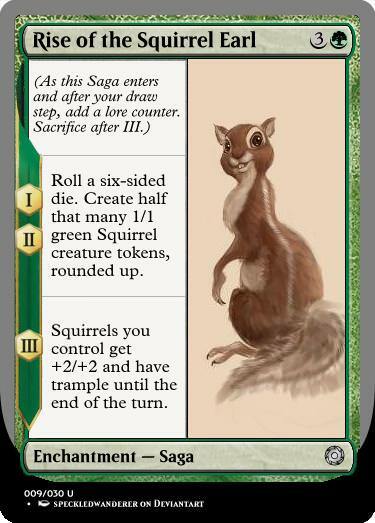 If you do, create a 2/2 green Cat Warrior creature token with forestwalk. -13: Destroy all lands your opponent’s control. Then, starting with you, each player puts a land card from a graveyard onto the battlefield tapped. Repeat this until there are no land cards in graveyards. At the start of each upkeep, the turn player exiles a random nonbasic land they control unless they sacrifice a creature. "There's a reason nothing can bee seen in pure darkness." 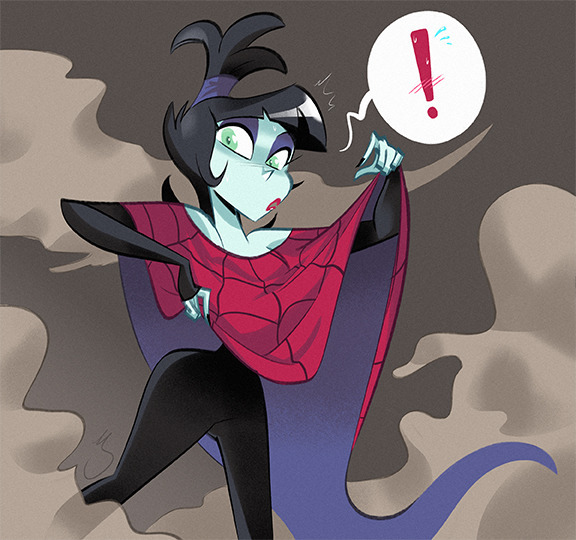 Well, it is the month of Halloween. Up: Dark. So dark. Almost feels like an enchant world. Honestly, i didn't think anyone would be crazy enough to go through with it. TBT, i was just expecting to get called out for breaking the obscure fiction rule. UP: Thankfully the reverse side has abilities that mostly accomplish Blue-esque results though the -3 might be pushing it. (Tbf, what transform card hasn't?) I think what bothers me more than anything else is that there's no real strategy to the front half - you just rush it out and hope it gets in enough whacks before an inevitable shock. Time to be technically correct. , : Target creature gets -2/-2 and can't be blocked until end of turn. If a creature dies this way, transform ~. 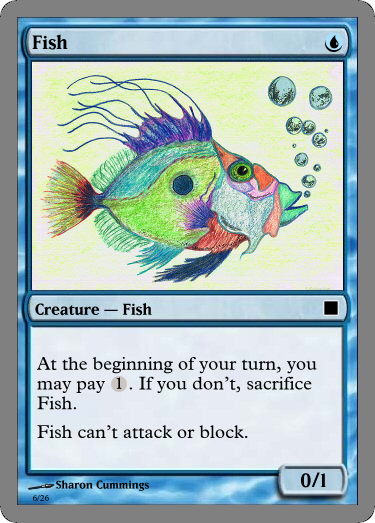 , : This card’s name becomes the card name of your choice and this creature loses this ability. Your opponents can't cast spells that share a card name with this creature. ...to the one that binds souls to graves. Think of _____'s slightly less silver-border-style cousin. Up: To paraphrase Number 1.0: You are technically correct. The best kind of correct. Interested in why you used Nephilim, since every example of them we have is 4-color. But they weren't a terribly /good/ cycle to begin with, so maybe the rules need to be rewritten for them anyway. I wrestled a bit with whether I wanted to make a new Gate or just a card that interacted with them. Then I debated keeping it Guild-themed as the Gates have been thusfar. I thought about doing some 3-color nonsense, but then decided that Guild lands as they are still had some room to expand, so I drew some inspiration from Future Sight lands, mixed in some new mechanics, and came up with this. 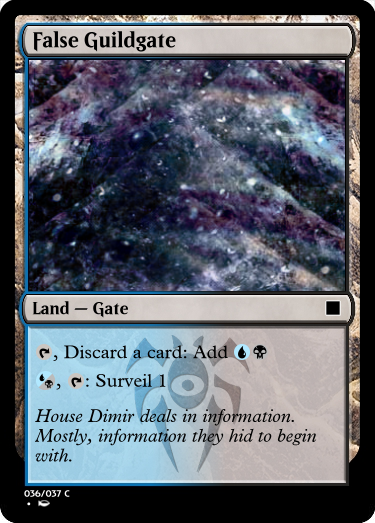 If House Dimir is publicly known, now, they should have a Guildgate that the general public gets to see, right? Up: T1 untapped 2 mana is very risky. Imagine playing a turn 1 Dimir Spybug, then just surveilling every turn. I’d recommend entering the battlefield tapped, or some other drawback. And I really hope this isn’t a common. Whenever fortified land becomes tapped, create a 1/1 white Soldier creature token with lifelink. If fortified land is a Gate, create two of these tokens instead.